James Martin turns a classic cake into an indulgent muffin, packed full of lemony zing. Preheat the oven to 200C/400F/Gas 6. Line a muffin tin with paper cases. Mix the egg, sugar, milk and oil in a large bowl. Sift in the flour, baking powder, salt and then add the lemon. Roughly mix. Spoon the mixture into the pre-prepared muffin cases. Bake for 30-35 minutes until well risen and golden. Cool on a wire rack. Make the lemon drizzle topping by mixing together the sugar and lemon juice. Spoon the lemon drizzle mixture over the cooled muffins. 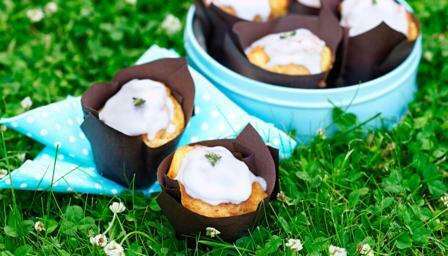 If desired, decorate the muffins with sprigs of lemon thyme.